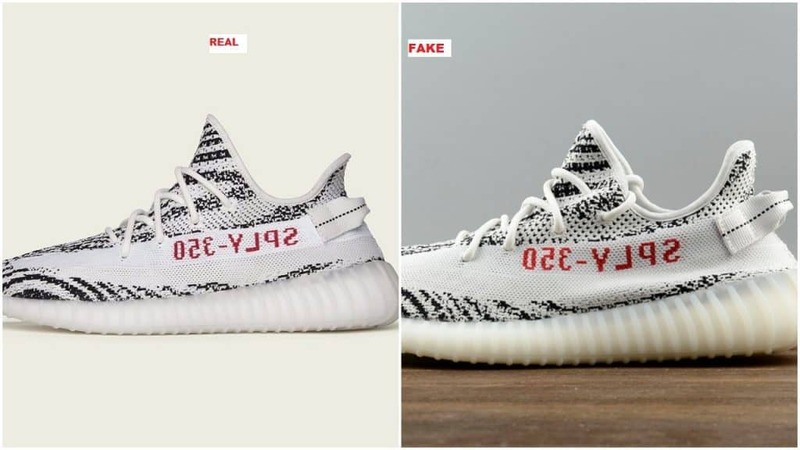 The first thing you can directly check whether your V2 ‘Zebra’ is legit or not, is the price. 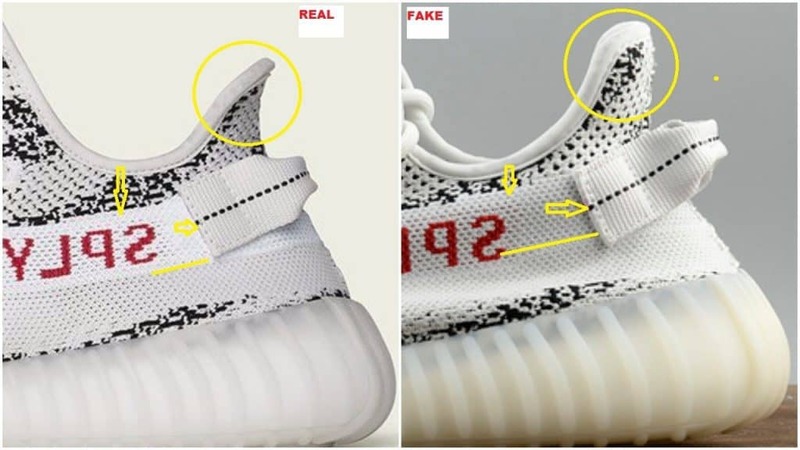 If you see a Yeezy V2 ‘Zebra’ for retail or even under retail, be careful! It should be definitely a fake. Legit Yeezy V2 pairs normally always have a quiet long pointy tongue. On fake pairs you will notice that the tongue is sloppier and also shorter. The characteristical ‘SPLY-350’ lettering on the side of the V2 is always straight-lined, whereas on fake pairs it might be curvier and not horizontal on authentic pairs. Moreover the red color of the lettering could differ. The heel from an authentic pair of a Yeezy Boost V2 ‘Zebra’ is slightly rounded at the end. Compared to the legit pair, the fake pair shows a way steeper heel. Furthermore the gap between the white side-stripe and lining is smaller on fake pairs than on authentic ones. Also the gap between heel strap and ‘SPLY-350’ lettering is bigger on fake pairs as you can see on the picture. Lastly, the heel strap of the V2 is not correctly appliquéd. Taking a look at the toe box of the adidas Yeezy Boost 350 V2 ‘Zebra’, take especially a closer look at the tip. You will notice that the tip of a legit pair is perfectly rounded and the tip of a fake pair really chopped. 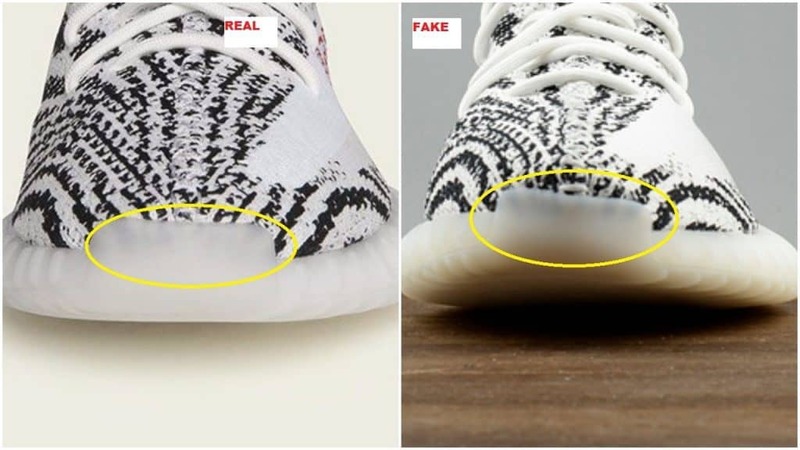 Moreover the gap between the white stripe and the tip of the shoe is bigger on authentic pairs than on fake ones. 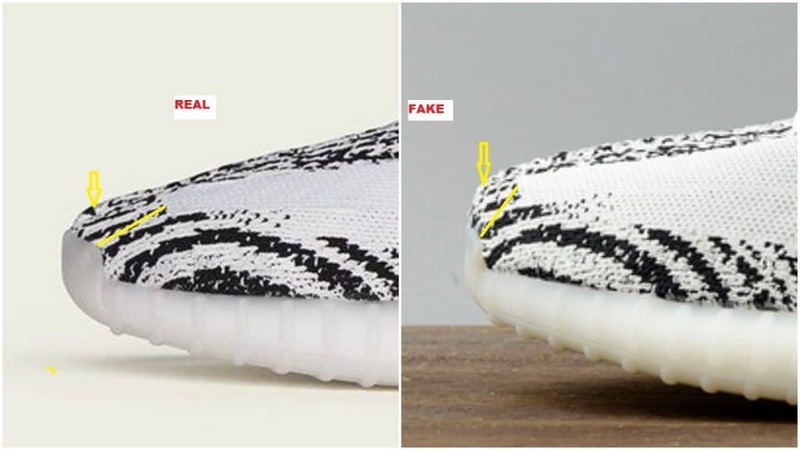 When you check the tip your V2 ‘Zebra’, the outsole should be straight-lined. On fake pairs you probably will notice crooked mounted outsole. 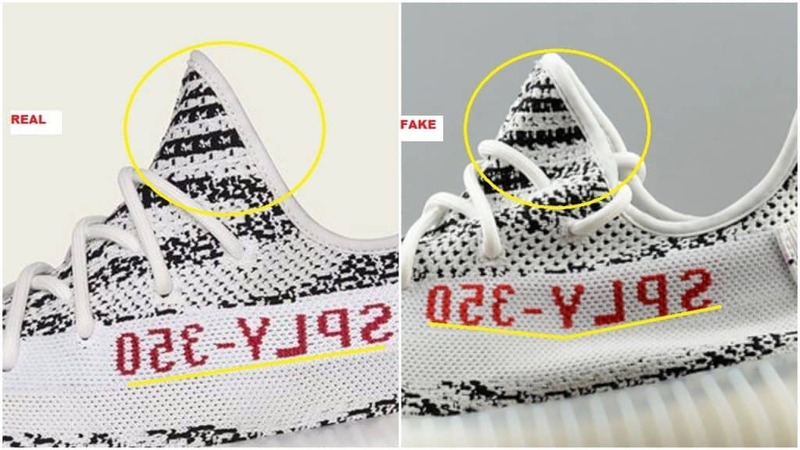 The tip is also smaller on fake pairs. All in all you can determine a better workmanship on authentic pairs.